Besides the KVM switch which allows you to take control of multiple servers, there are also the KVM extenders. This solution can be really handy for recording studios which need to have their micro and monitor in a silent room. Why? These devices enable you to connect a keyboard, screen and mouse to a single server in a remote location. So, the noisy computer will not be heard. In most cases, you can establish a connection with 2 units via a copper (CATx) or fiber cable. One is placed at the server side (the KVM extender transmitter) and the other on the user side (KVM extender receiver). The connection is usually dedicated but may also be established over an IP network. In addition, these extensions accept all types of video output (DVI, DisplayPort, VGA, etc.). The company Adder offers very high-performance solutions for the digital KVM market. It has a very wide range of extension units with many variants (digital and analogue) and a maximum resolution of 2560×1660 pixels. 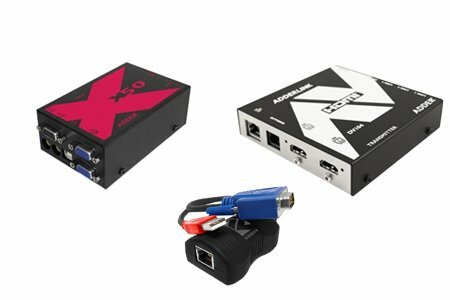 KVM extenders from Adder make it possible, for example, to display a server on one or more screens. The aim is either to allow users to perform their everyday tasks or to use the screens for digital signage technologies. Possibility of extending the distance via a chain of switches or hubs. 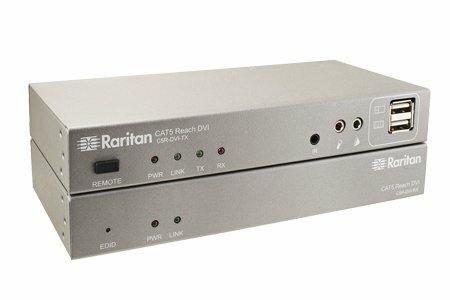 Raritan&apos;s extension solution permits the remote management and high-resolution display of a server or KVM in DVI and VGA mode. This KVM extender over CAT5 is special in that it uses switches or hubs to share videos of a server on multiple receivers. Possibility of extending the distance via a sequence of switches or hubs. These "point-to-point" connections reach distances of 10 to 300 metres. However, if other network equipment (switches or hubs) is integrated, they can reach 900 metres or more. Furthermore, the SFP connector provided for in some types of extenders makes it possible to reach 10 km!